Groundwater is one of the most valuable of all natural resources and the major source of water in many parts of the world. Ninety-eight percent of the Earth’s available fresh water is groundwater. In the U.S., groundwater is a key source of drinking water and irrigation. Nearly half of the total population and 90 percent of the rural population is dependent upon groundwater for their drinking water supplies. However, agricultural irrigation is the largest user, consuming more than 50 billion gallons of groundwater per day. A groundwater basin is defined as an underground reserve of water, which may take the form of a single aquifer or a group of linked aquifers. In Oklahoma, groundwater is found in 21 major basins and 150 smaller basins (Nelson et al., 2003). Oklahoma’s aquifers store approximately 386 million acre-feet of groundwater. Groundwater accounts for 73 percent of the total irrigation water use in Oklahoma (OWRB, 2017). Western Oklahoma’s groundwater is found in several formations, including the Arbuckle Group, Dog Creek Shale and Blaine Gypsum, Rush Spring Sandstone, Elk City Sandstone and Ogallala Formation, as well as in alluvium and terrace deposits (Nelson et al., 2003). For more information about groundwater physical properties and state laws, please see the Oklahoma Cooperative Extension Fact Sheet WREC-104: Introduction to Groundwater Hydrology and Management (Fox et al., 2016). General groundwater information can be obtained from various national and state level sources. Some of the sources are mentioned in Table 1. Specific location details must be measured, however. Table 1. Sources of national and state level groundwater information. Over the years, excessive groundwater pumping has led to a decline in the water table levels at many locations. For example, the water level in the Ogallala aquifer, which is a major source of irrigation water in the northwest and Panhandle regions, has declined an overall average of 19 feet from 2001-2017. Similarly, the water level in the Rush Springs location dropped by 10 feet during 2001-2017 (Khand et al., 2017). A large portion of this total decline occurred during the drought of 2011-2015. Some localized areas in the Oklahoma panhandle have experienced drops of over 130 feet in the last 60 years of monitoring (McGuire, 2014 and Taghvaeian et al., 2016). Consequently, well capacities have declined and water users have to drill deeper wells to extract enough groundwater to meet their needs. Drilling a deeper well requires additional expenditure in terms of both cost and energy. Additionally, moving pumps deeper into the ground increases the Total Dynamic Head (TDH) on the pump. This affects pumping efficiency, system performance and energy use. Monitoring groundwater level helps water users and engineers better understand the groundwater conditions of the area. Monitoring is especially helpful to agricultural producers, as measured water level is an indicator of the water level trends over time and groundwater availability in the near future. There are two types of measured ground water levels: static water level and pumping or drawdown water level. 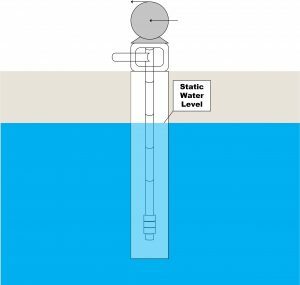 Static water level is defined as the level of water (from the land surface to the water in the well) under normal, undisturbed, no-pumping conditions. 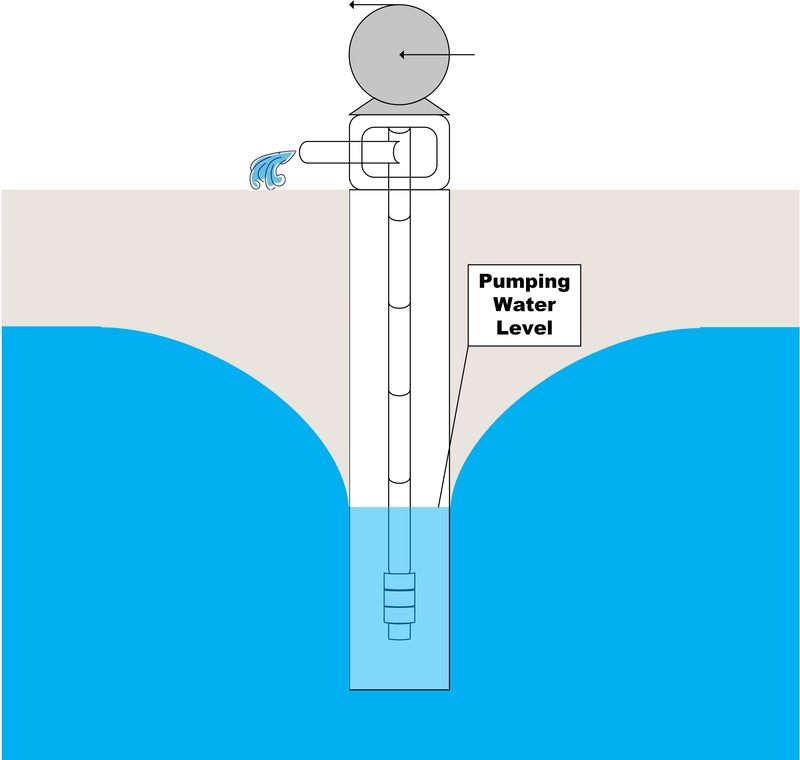 Pumping water level is referred to the water level while the well is being pumped. 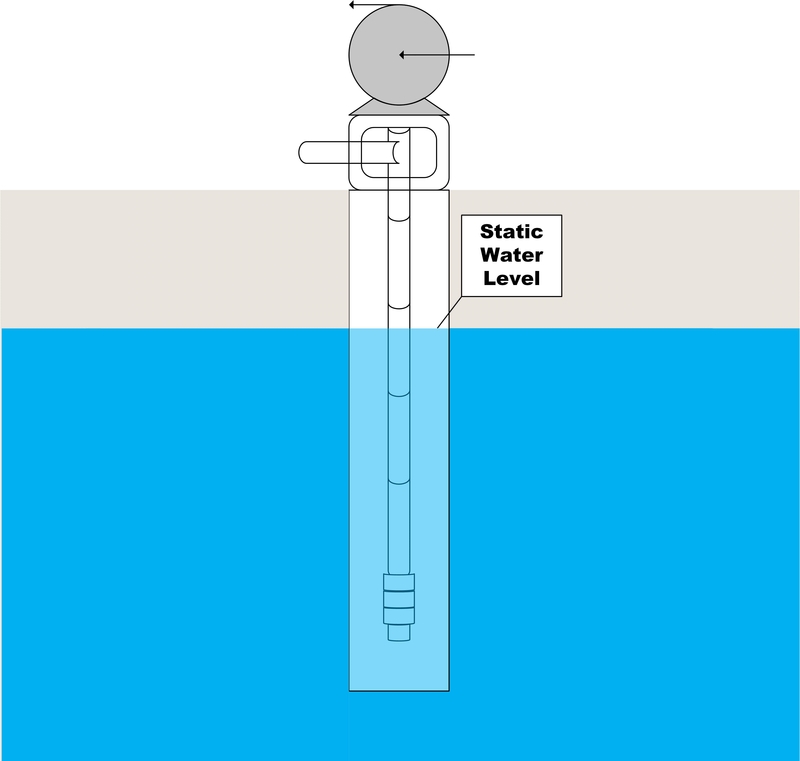 Figure 1 demonstrates static and pumping water levels. Normally, static water levels are measured before or after irrigation season, in spring and fall. Pumping water levels can be measured during mid-summer, when the wells are in operation. Groundwater level is fairly straightforward to measure and can be monitored in a number of ways. A metal tape, an electrical well sounding device and pressure transducer are the three common types of devices used to measure groundwater levels. Of these, an electric well sounding device is the most practical, easiest to use and the most effective method to measure water levels. Agricultural wells are usually less than 400 feet deep in western Oklahoma and are easily within the electrical sounding device’s range (assuming one uses a 500-foot conduction line). Figure 1. 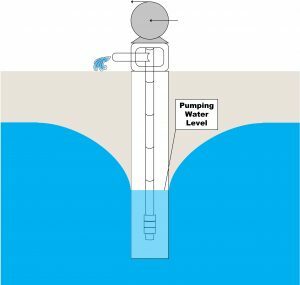 Static and pumping water levels. 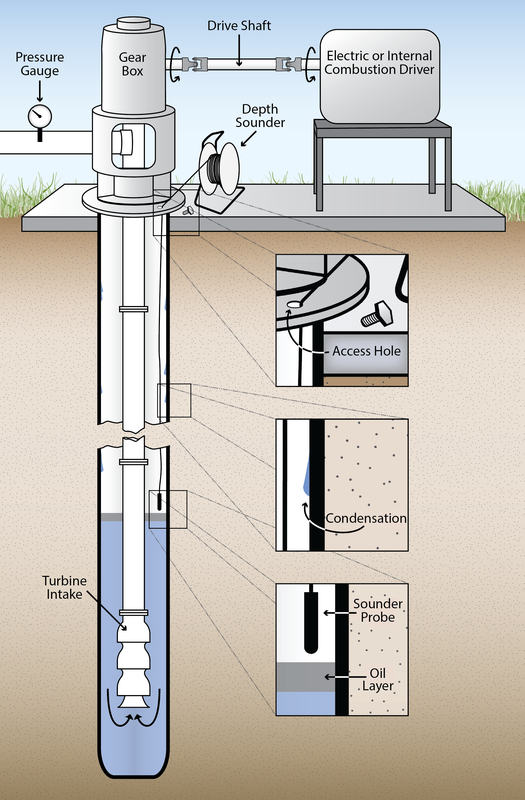 The electric well sounding device is a simple compact instrument used to measure water levels. The sensor consists of a small-diameter, stranded stainless steel water probe attached at the end to a narrow cable, mounted on a reel. Most commercial brands produce two indications when water level is reached – an audible buzzer and a visible light. The sensor at the end of the cable depends on the water electrical conductivity to indicate contact with the water level. When the sensor touches water, the buzzer on the reel sounds and the indicator light comes on. The sensitivity of both the buzzer and light can be adjusted so it will not give false readings from condensation on the pipe walls (see Figure 4). The cable has etched depth markings of feet and inches. The cable comes in a variety of lengths ranging from 100 to 1,000 feet with subdivisions as small as 1/100th of a foot, or 1 millimeter. 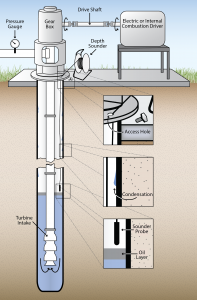 Figure 4 demonstrates the basics of measuring depth to groundwater using an electric well sounding device. 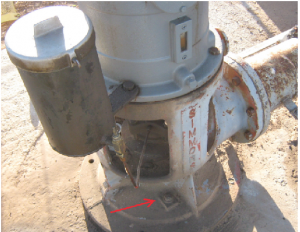 Typically, the probe cable is inserted by removing a dedicated access hole or cover provided in the pump wellhead (Figure 2). Occasionally, an access tube such as a PVC pipe is provided (Figure 3). If an access hole is not available, one will have to be drilled and plugged. This modification to the pump base is best performed by someone knowledgeable with irrigation systems. To carry out a measurement, the cable is carefully fed into the access hole. As more cable is fed into the hole, the cable becomes heavy due to the cable length. 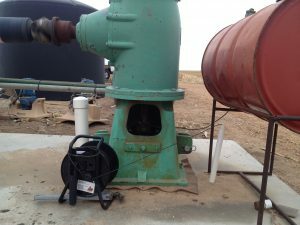 The pump may be running while taking measurements, so care must be used to keep the probe and cable near one side of the casing and avoid contact with the turbines or bowls. Figure 2. Pump base showing access hole location. Figure 3. Cable going into well access tube. Figure 4. Measuring depth to groundwater using an electric well sounding device. 1. Before each use, test the battery and the sensor in a cup of well or tap water. Do not test with distilled or bottled “spring” water. 2. When rewinding the cable, clean off water, oil and dirt from both the cable and the sensor. 3. Always store the water level meter with the On/Sensitivity dial in the OFF position. 4. In case the water level meter is not to be used for a period of three months or more, remove the battery before storage. 5. If an oil layer is floating above the water level (Figure 2), make use of the probe covers or cloth. The probe covers allow water to pass through it, but not oil. 6. In rare instances, the groundwater will have low dissolved salts, and the probe will work poorly. In those cases, salt can be applied to the probe tip to increase sensitivity to the water. 7. Sometimes the cable and probe will hang up on something inside the well casing, which will cause a sudden decrease in the weight of cable (the line gets lighter). If this happened, pull the cable back up a short distance and start lowering again. If you feel a strong vibration in the line, immediately raise the line and carefully lower again. 8. If the probe and cable are stuck in the well casing and will not come back out, it is better to abandon the cable and/or probe. Permanently tie-off the cable on the surface and plug the access hole. The cable may free itself eventually. Do not cut the line and let the probe and cable fall into the pump turbines. 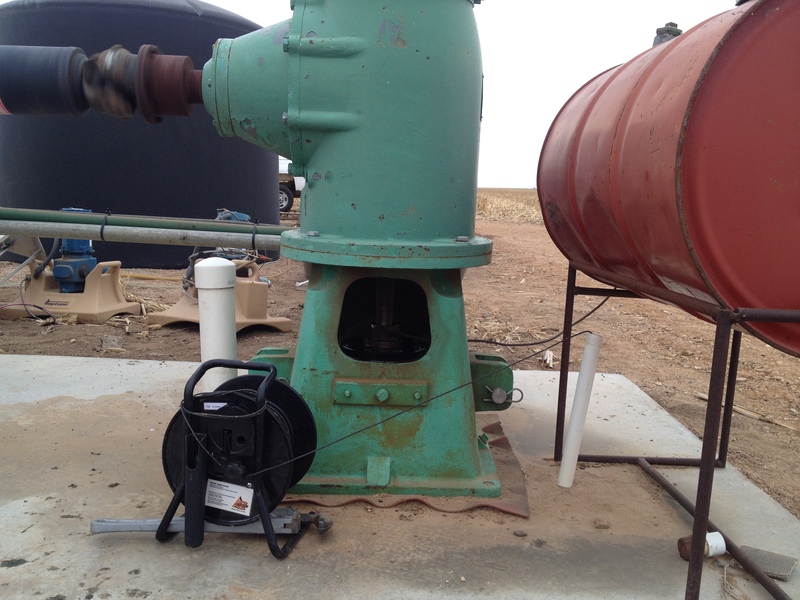 To date, the biosystems and agricultural engineering team has conducted energy audits on 26 irrigation pumping stations in central, northwest and Panhandle regions of Oklahoma. A main input required for estimating the efficiency of energy consumption is the pumping depth, which is the depth to groundwater after the irrigation pump has been running for an extended time. Figure 5 demonstrates pumping depths, measured at tested sites (each bar is a test site) using the device explained in previous sections. The numbers are ranked from smallest (shallowest water tables) to largest (deepest water levels). As this graph shows, depth to groundwater had a large range, varying from 33 to 379 feet. Most of the audited sites were extracting water from either the Rush Spring or Ogallala aquifers. The average groundwater depth was 104 feet for the wells tapping the Rush Spring and 273 feet for the Ogallala aquifers. This material is based upon work supported by the Natural Resources Conservation Service, United States Department of Agriculture, under number 69-3A75-16-013. Funding was also provided by Oklahoma State University’s Division of Agricultural Sciences and Natural Resources and by Oklahoma Water Resources Center (U.S. Geological Survey 104(b) grant program). Nelson, J. R., & Bird, J. C. (2003). Groundwater: A Resource for the Future. Division of Agricultural Sciences and Natural Resources, Oklahoma State University. Oklahoma Water Resources Board (OWRB). (2017). Groundwater Monitoring and Assessment Program Fact Sheet. Accessed at https://www.owrb.ok.gov/about/about_pdf/Fact-GMAP.pdf on June 2017. McGuire, V. L. (2014). Water-level changes and change in water in storage in the High Plains aquifer, predevelopment to 2013 and 2011-13 (No. 2014-5218). US Geological Survey.